One of the most striking paintings in Winchester’s historic Guildhall has gone back on display this month after major restoration. The Children of the Thirteenth Marquess of Winchester was painted by Thomas Stewardson around 1812. The large (1.89m x 2.34m) oil-on-canvas shows the seven children of the 13th Marquess and his wife Anne – John, Charles, Cecilia, Annabella, Frederick, George and William – with their dog. Stewardson (1781-1859) was a Georgian portrait painter who exhibited at the Royal Academy and who counted Princess Caroline and King George III among his sitters. Winchester City Council has two other portraits of the 13th Marquess and his wife by the same artist. 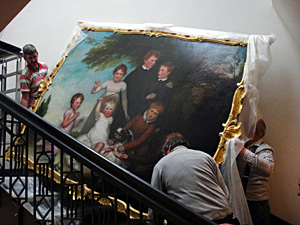 The Children painting was in serious need of repair and conservation and was removed from the Guildhall on the 5 August 2013 by The Brick House fine art conservation studio. To bring the picture back to its former glory, layers of dirt and yellowed varnish had to be removed, areas of canvas were strengthened and whole sections of the decorative carved wood frame were replaced. The treatment also included work to prevent and reduce future deterioration and prolong the lifespan of the painting.